If I had to pick a career today, I might choose to do something related to nanotechnology. While researching this book, I learned so much about this tiny science - from how scientists see things that small to how they are using nanoparticles to cure cancer. 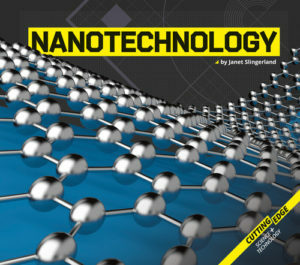 This book explores key concepts and applications of nanotechnology. There are several mini bios of extraordinary scientists in the field and examples of how nanotechnology is changing the world. Great Book on tough subject made easier to understand by the author. Great for kids and parents wanting to know more about current science. There are some web links on Abdo's BookLinks for Nanotechnology. Scientific American and Science Buddies put together a great activity that explores nanotechnology using paper. Physics Central (from the American Physical Society) has lots of great stuff. There is a page dedicated to Quantum Mechanics - the physics that applies to the nanoscale. There is also a page on material science, another topic that is tightly coupled with nanotechnology. The National Nanotechnology Initiative has a web page for students that includes links to other web sites, games, and places to visit to learn about nanotechnology. NISE started out as an initiative dedicated to nanotechnology. It has expanded its scope to include all STEM fields. This page provides some info on how this all came about, where the nano-related items went, and what else you can find at this amazing web site. By 2100, our destiny is to become like the gods we once worshipped and feared. nanotechnology, artificial intelligence, biotechnology, and most of all, the quantum theory.